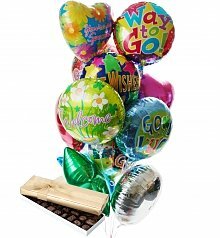 Chocolate and balloon bouquet gifts are a delicious way to make any recipient smile. 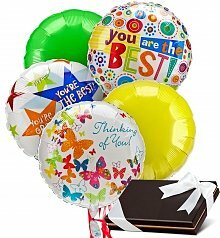 Make your message memorable with GiftTree balloon bouquets and flowers and balloons. For a festive occasion, choose balloons from our selection of birthday balloon bouquets, thank you balloon bouquets, and congratulations balloon bouquets. 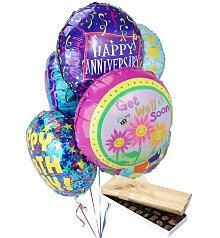 For the just the right message for that special person, choose from our anniversary balloon bouquets, romantic balloon bouquets, or Valentine's Day balloon bouquets. When sending warm wishes and thoughts, choose from our impressive selection of thinking of you balloon bouquets and get well balloon bouquets. From new baby balloon bouquets to business balloon bouquets, choose from the fantastic balloon bouquet selection at GiftTree!